Foxwell NT510 BMW Mini good test results and bad test reports. – The included software is not native to Mac computers. – Can provide sensor data from the oil level system on an F82 M4, The M4 apparently can only read the oil level with the iDrive, which we plan on permanently removing for non-street use. 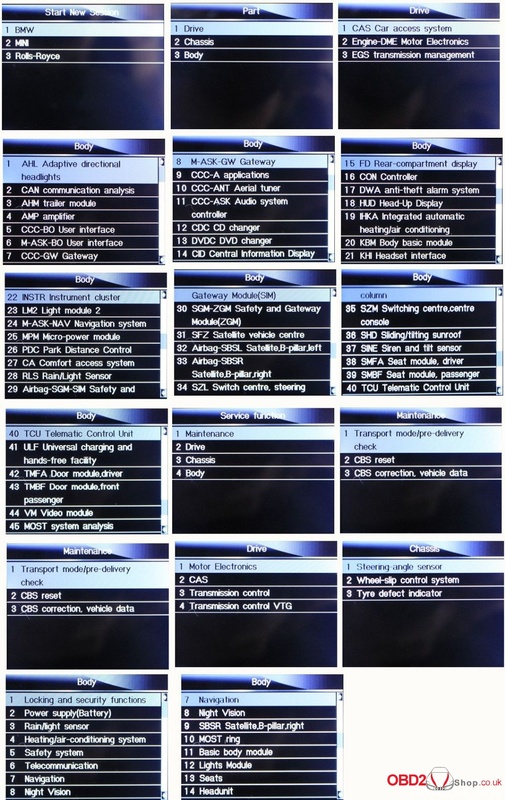 – Can read codes from a transmission control unit (TCU) on a 2003 e46 325xi. – Can register a battery to an e90 328i. – I have a 2007 328i Coupe, NT510 can determine which wheel speed sensor is bad. – NT510 can read and reset airbag service light. I have an intermittent airbag service light on a 2004 X3 that BMW service cannot track down as it clears from memory before I can get it in for service. – Have the ability on the 09 BMW E82 135 to scan for ghost codes, and any other stored codes. For example, example it will read codes that you did not get a scanner connected fast enough while the check engine light was on and it goes off before you know what the code actually was. -Can code new injectors in the BMW 2010 335i. -Can Re-program the Speed Governor on 2011 e90 328i LCI model, VIN WBAPH7C52BE852716…please note: Performance software is required to manipulate top speed limiters. – Is capable of functioning as a universal OBDII reader for all makes in addition to it’s BMW/Mini/RR Specific functions. – Can work with a 2012 mini cooper countryman s all 4. – Have E36 OBD1, for OBD1 cars will require adapter ES2992111 to perform function, Available features will be dependent upon the cars abilities. Not all features are compatible with all models. -Communicates via the OBDII plug in the cabin on the E39 M5 2000, no extra adapters needed. – Whether NT510 can read TPMS codes or not (Specifically to tell which TPMS receiver is malfunctioning), it depends on the vehicle, If your car has the ability to provide this information the tool will be able to pull this data. – can read and reset O2 sensor readiness codes but will not code them off permanently. – Updates can be skipped; sequential installation of updates is not required. – Can reset “Right/Left Cornering light” warnings on 2011 335d caused by after-market halo installation. To properly clear the error code you need halos with proper resistance, this will cause the car’s computer to automatically reset the warnings. – I own a 2011 335i N55. all functions are supported across the E93 series. – Ok to reset the Airbag/seatbelt light on Mini Cooper S R56. – Ok to modulate the e-parking brake on a 2012 BMW F10 to enable a rear brake job with rotor replacement. – Module recoding and programming is possible with this tool. – Availability of features of this nature will vary heavily model to model and year to year. – Can register new tire pressure monitoring sensors. – Can do VANOS test, Idle Sync etc for e46 m3. -Can activate the abs unit in order to bleed it on a 2008-011 m3. – Can do battery registrations and coding on BMW and mini cooper. – Be able to code a new battery on 08-2011 M3’s. – To make NT510 is compatible with the early E36 (The car has ads modules for Abs and srs), need the 20 pin adapter ES2992111. – Can reset the adaptations needed after an e46 m3 smg clutch change. – Allow for line code changes when programming car options, such as automatic door locking. – Enable auto rear window defogger for GM5 module on BMW E46. E46 general module coding is possible. – Can perform the dynamic drive reset for a 2002 745. – Reset the transfer case oil wear indicator on BMW e83. – Be able to display the sensor’s output if this function is registered by the car’s dme. – Able to reset transfer case adaptations after transfer case fluid change in an F32. – Allow coding of the LCM and GM on BMW vehicles. – Have the ability to program new ABS components to current vehicle. – Can code for Xenon headlight conversions and also for activating *Sirius Retrofit Enable Code (FSC)* for Mini Cooper R56’s, but only some models not all. – Can code injectors and new battery on 2008 BMW 135i. – reset my wife’s X5 remaining mileage countdown after I refilled the DEF. I was really impressed with his Foxwell with all the options that were given for BMWs. – NT510 scanner cannot remove the top rpm limiter on a bmw z4m roadster 2007, performance tuning software is required to remove top speed limiters. 1. Foxwell NT510 is optional add up to 5 car brands, add one for only 70USD. The optional brands incl. Chrysler GM Honda, Accura Hyundai, Kia Toyota, Lexus, Sicon Land Rover, Jaguar OPEL, Vauxhall VW, AUDI, Seat, Skoda BMW Fiat American Ford Mazda Maserati Ferrari Aston Martin Volvo. 2. How to download BMW software? The NT510 usually comes default with no car specific software, you are supposed to download BMW software for free. Tip: not compatible with Ipad and MAC system. Jaguar code scanner, Foxwell NT510 or iCarsoft Lr II?